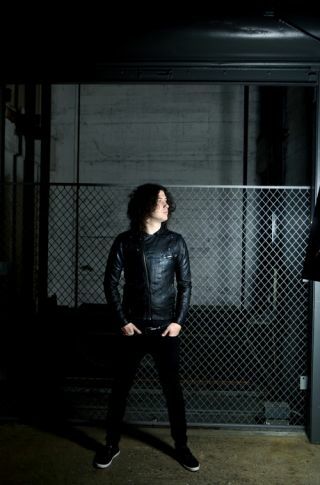 As Ilan Rubin's The New Regime swept through the UK in support of Taking Back Sunday we caught up with the drummer-turned frontman to hear all about the latest plans for his solo project. The band's 2008 debut sparked our attention but it's the recently-released follow-up that really grabbed us by the scruff of the neck. Packed with finely layered, multi-textured rock, Speak Through The White Noise is what will surely prove to be the breakthrough moment in an absolutely huge career. The album sees Ilan handle just about everything from drums, guitars and piano to vocals, a mix that he tells us meant he had to have a mature head on his young shoulders when laying down kit parts. "When writing songs, the drum parts are always secondary to the chords and the melody," Ilan says. "The beat of the song is almost never the priority but I always try to make the drum parts interesting without getting in the way of anything else. But depending on what kind of song I'm writing I know how busy or simply I need to play. For example with a song like 'Remission of Guilt' I was able to play a very busy beat because the chord changes were so long that the playing wouldn't interfere with anything." But don't be left thinking that having his finger in so many musical pies means that Ilan neglected getting a huge kit sound on the record. He says: "The sound I always want to go for is a modern Bonham sound. I want the openness and ambience captured, but with modern recording techniques you usually need to do a bit for the drums to stick out through the multiple layers created by the other instruments." This process of layering allowed The New Regime to build an atmospheric sound that's part fuzz rock part Muse stadium filling enormo tunes, with 'Live In Fear' a particularly potent example of the combination. Ilan explains: "For 'Live in Fear' the beat was able to be showcased because by the time the vocals started, the chords only changed once every measure." If you caught The New Regime on their UK tour over the last few weeks you'll have seen that Ilan doesn't have to juggle his many roles while on the road, with touring sticksman Trevor Faris lending a much-needed extra pair of hands. Ilan admits that he has several considerations when looking for someone to hand his lovingly-crafted drum work over to. He says: "When looking for a live drummer I obviously look for someone who can handle the parts, has a real work ethic, handles themselves as an adult, and someone who isn't annoying to be around. The musician aspect is definitely the most important, but its not fun being stuck in a touring situation with someone you can't stand." Touring sticksman Trevor adds: "As a drummer, working with Ilan has been a real pleasure. The experience has brought more focus to my playing and he's been able to help me work out a few long running technical issues I've had. I'm having a great time".